Our lives are spent accumulating memories. We try to forget, or at the very least, learn from the bad ones, and hold onto and cherish the good ones. Hopefully our lives have been filled with more good memories than bad ones, and many of those, if we are lucky, will have been from happy, fulfilling childhoods. Holding onto childhood mementoes is precious. We can use them as ways to reminisce and remember the simpler times, or share with our friends, spouses and children as we go through life. 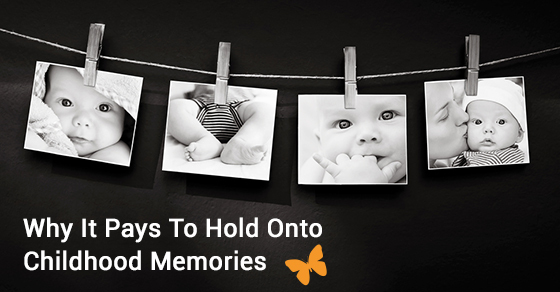 Below are some of the reasons you should strive to hold onto your childhood memories. You can spend so many years in your life trying to get where it is you think you need to be, that the past becomes a blur. Having childhood mementoes allows you to put together the puzzle that led you to where you are today, so that you never forget where you came from, and the seminal moments along the way. If you have a lot of momentoes hanging around, taking up space, perhaps putting them into storage at your local self storage facility would ease some of the storage burden. Most people in your adult life are going to have spent at least a couple of decades less with you than you have. Having things to show your loved ones from your life before them is a great way to humanize yourself, showing them that you were once just a wide-eyed kid with the world at your feet. If your kids aren’t old enough to appreciate these sorts of memories yet, keeping reminders of them in storage until the day arrives will make sure your storage space around your home doesn’t become cluttered. Holding on to your childhood memories is not only something that will provide enjoyment for you and your family in the immediate future, but it is something that will allow your legacy to echo well into the future. At some point you may cease to be solely a parent, or even a grandparent, but as time marches on, a great grandparent, a great great grandparent, etc. Your story will become part of a much larger one, and having momentoes around to show people will create a rich experience for future generations of your family. Holding onto childhood mementoes—whether you have them in your home or tucked away in document storage—is a great way to provide your family with further insight into who you are and what made you who you are, and provide you with a way to travel back to the past and relive great experiences that impacted your life.